Vegas Sin City Hot Air Balloon Rides does hot air balloon rides over Las Vegas. 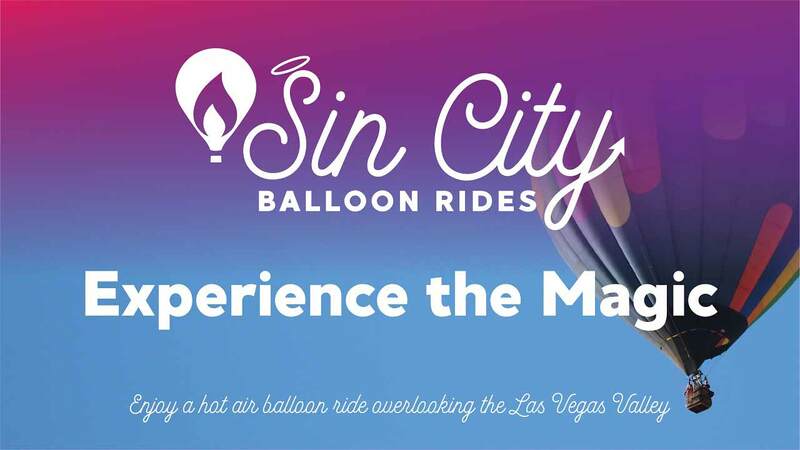 Vegas Sin City Hot Air Balloon Rides is the best way to see Las Vegas. With stunning views of the Las Vegas Valley, including the world-famous Las Vegas Strip, it’s the ride of a lifetime. If you’ve always wanted to go on a hot air balloon, well then this is the place to do it. Vegas Sin City Hot Air Balloon Rides features sunrise rides where the day begins early at the launch site. The entire experience is between 3-4 hours so it’s a great activity to get the day started. The ride itself is just about an hour long so you’ll have plenty of time to get some incredible pictures. Some of the awe-worthy natural landscape that you’ll be able to see includes Red Rock Canyon and Mt. Potosi. Bring a group of friends or meet some new ones up in the sky because the balloon ride can fit 12 people. Once it’s over, you’ll be treated to a champagne toast to celebrate the landing and you’ll receive a certificate of flight completion. All the pilots (yes, it’s actual pilot flying the balloon!) are FAA certified and the company boasts that they have a century of experience amongst them. This is obviously not the kind of adventure one can do with a fear of heights but if you’re up for being thrilled and excited, then this is right up your alley.